Laxmi Charan Paduka is a rare Lucky Charm, mentioned in Vedas and Puranas. 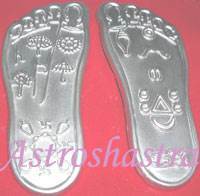 It is believed that keeping Charan Paduka in your Puja Room , Office , Home or Business Permises etc.brings Wealth and prosperity. As it symbolizes the foot prints of Maha Laxmi , Devi of Wealth and Prosperity. Goddess Laxmi emerged as fifteenth ratna in the bridal attire with lotus mala in her hand for Lord Vishnu or Narayana. Everyone hailed the Laxmi-Narayana and Goddess Lakshmi set her foot on haven. Her feet had in all 15 symbols, which brought prosperity in haven. All gods took impressions of Laxmi’s feet, called Lakshmi Paduka and installed at their places and celebrated by lighting lamps. The Laxmi Charan Paduka should face inside the house.